This is the first in a series of blog entries which cover the displays included in the Kemo Electronic S043 lucky bag sold at Maplin and describes the use of them. The series went under massive reorganisation in 2016 with the addition of new displays plus a new overview picture. Scroll down for the display index. This lucky bag typically costs £4.99 and contains 10 assorted displays. Each bag comes with a variety of different displays with balanced distribution, and generally a bag 2-3 large displays, 2-3 medium displays and 4-6 small displays, so you won't find one bag containing entirely HD44780-compatible LCDs and another containing 7-segment displays only. I wouldn't recommend just buying them on the website as you don't get to see what's in the bag unlike in store. The displays aren't individually packaged and they have the potential to damage each other in the packaging so you'll want to check for that before you buy. Click to view full size image. Image is oversaturated to highlight the different colours of the LCDs. Displays are numbered below in row-column format e.g. 4-1 is the tiny 7-segment display in the bottom left corner. Users should test all LED displays before building a stripboard/PCB circuit for them. 2-5 OLED Display (OS96016PP08MB2B10) has been moved to blog entry 3 (comments section). Found out how to add an external contrast control - remove R13 from the board, then run a wire from the conveniently marked VLCD pad to pin 18 on the connector which is normally unused. Nick, your PM message box is full. How did you progress with the code for the LCD display? But, the components are still very good value for money. The HD44780-compatible LCD pinout is shown in the leaflet provided with the displays which you can see by clicking on the first picture in the blog entry. The top row is normal 5x7 characters and works just like on a normal 16x2 LCD (i.e. they are all consecutive one one line rather than divided into two groups like on 16x1 displays) and the bottom row of symbols are activated as described in the blog entry. The LCD that requires elastomeric connectors (and which I forgot to include in the photograph) - I haven't attempted to use that yet. The little OLED displays - the eBay adapter board arrived and I got a display working and I've made a DS1307 clock demo that has so far been running for over two weeks off the same pair of AA rechargeables on the minimum brightness setting. I will make a schematic and post the example in Finished User PICAXE Projects soon. The OLED is definitely blue. If I haven't answered your question properly, ask again and give more detail. My progress. I had a thought... use the AXE133 firmware and adapt that. The normal commands all work to line 1 of the device. This includes position cursor control etc. I am trying to figure out the bottom line addressing. I have contacted a guy on another forum to see if he has any insights. @nick12ab - can you explain your contrast control a little more. Can you post the LCD that requires elastomeric connector? I am not sure I got that device. Can you share the the eBay adapter board ? Would you post the URL to the listing? The large HD44780 LCD. I have the top line operational but I cannot address the symbols. Any hints please..? I will take a picture and add it to the blog entry shortly. can you explain your contrast control a little more. I've taken a picture to show you and I will add it to the blog entry shortly. I mounted the OLED on the PCB with the PCB having its through-hole connectors at the bottom and the OLED's connector soldered to the 0.7 pads with the screen facing down and overhanging the top of the PCB. Once it had been soldered, I then folded the display over so that it faced upwards and blu-tacked it to the flex. The symbols start with address 192, just like it would do if there were actual character places there. Well done on the OLED!!! I must place order eBay. I will wait for your code - well done. Here is the table of information that I have created this evening. I am using the standard AXE133 code as the Picaxe interface to the LCD, 8-bit. (I know think I code use 4-bit by pulling D0-D3 to ground which I failed to do yesterday - but, it ho hum). I think the symbols are in two pairs, addressed as you say by the characters but the addressing is as shown in the routines below. So, the first two are address @ 254,193, "D"|"J"|"E"|" " The space clears the chars. They run in two step until 199 then 1, then back to two step... odd. But, this code does seems to work. Do you think this is stable?
' I have 08m2 to 18m2 to LCD. I know that the symbols weren't in a logical order. I disassembled my test circuit a while ago but I might get around to finding out the addresses for each part. Anyway, OLED clock demo now posted. I cannot see anything wrong with that code. I will be reassembling a test circuit to find out the exact address of each symbol on the LCD. 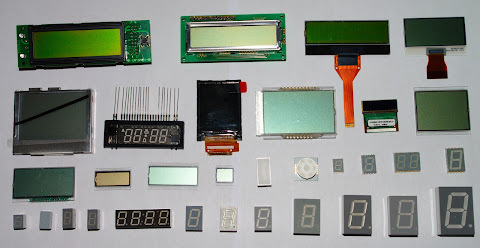 Did you get the LCD that requires elastomeric connector, a surface mount 7 segment display or something else? Have your adapter boards arrived yet? Thanks for the helpful article. I've got the LCD working with my Arduino (LEDs and button too), and I'm wondering what I could do with the OLED displays. Do you think that they might fit into a breakout board like this one? Soldering anything onto those little tabs is a bit beyond my ability! and I'm wondering what I could do with the OLED displays. Do you think that they might fit into a breakout board like this one? You can't use that breakout board because it does not have enough pins and the tab is too wide to fit in that. Soldering it is not as difficult as it looks - purchase a breakout board like the one in my pictures, apply solder to the appropriate pitch connector, line up the OLED with the connector then apply solder to a few pins at a time while gently pressing down with the soldering iron. I have the connector/adapter off Ebay. A great piece of advice as I would never have been able to locate the adaptor. Currently travelling so no time for the project until I get back soon. I test align the connectors and they are accurately aligned. Thanks for helping. I just to stop travelling for work so I can get back to my project. All, just checked out my local Maplin (Leeds). One pack left on sale. Connectors on both oled displays clearly knackered. There is another Maplin in Leeds and others in Wakefield & Sheffield, might check them out. All, just checked out my local Maplin (Leeds). One pack left on sale. Connectors on both oled displays clearly knackered. To be honest, the oleds were the most interesting to me, because of the small size and i2c interface. I already have a few 16x2 lcd cheap from china. Managed to find a pack in the other Leeds Maplin with oled connectors in decent looking condition. Have also ordred some dip adaptors from China on eBay. I bought a pack of 10 adaptors so hopefully will have a few available to sell or swap eventually. Nick, would you mind describing in more detail the easiest way to solder these? I've never tackled smd devices before. Cheers. First put leaded solder on the contacts on the 0.7 connector. Do this by feeding the solder into the tip of the soldering iron while running the tip from one end of the connector to the other. Fresh solder should not create any solder bridges between each pad - if this happens add more solder. Minimize the time that the soldering iron is melting the solder for. Hold the OS96016PP08MB2B10 OLED with the display facing down and the IC on the tab facing upwards. Line up the connector with the connector on the PCB (positioned like this here) and solder the pins in small groups by gently pressing down on the connector with the soldering iron tip, adding extra solder if necessary. Once soldered, fold the display part over so that it faces upwards and stick in place with blu tack. Now solder the headers to the provided holes. P.S. Can you tell me what 10 items you got in your lucky bag? The contents does vary slightly between lucky bags. Got a photo of my pack here but can't attach it. Unlike posting in the forum, there's only the option to add a link to a photo. Anyway, I have the ampy lcd, the square bare lcd, 2 oleds, the 4 digit clock led, a 2 digit led, a single digit led, 2 tiny single digit leds and a bar-graph led. Thanks for the soldering instructions. You can attach a link to a photo or file which itself is an attatchment in the Main Forum. I made a forum posting with 2 attached files, then pointed the Blog at those. But won't posts I the sandbox get deleted without warning? I put the oleds in those sd card cases to protect them until needed. I haven't tested anything yet so don't know the colour of the leds or if they are ca or cc. Progress so far. I have built an adapter board based on your good advice. Next, figure out all the components. And, why cant I post pictures? You can post the pictures as an attachment in this thread. Question re the idea of @alecw. Why would the http://proto-pic.co.uk/ffc-breakout-board/ not work? It looks ok but expensive. Back to nag you again - have you got the OLED working yet? I haven't even tried with mine yet. I have the adaptors, the ones you suggested. I'm not looking forward to the soldering despite your encouragement. I struggle sometimes with 0.1" components, as you may have seen on the main forum the other day. Wondering about investing in a temp controlled iron, a flux pen and a wider selection of bits. Might put them on my wish list, although my birthday's a way off yet. I soldered mine with a normal Antex CS18 soldering iron with the normal 'one flat side' tip, with leaded solder. Making sure you have decent lighting will help you align the connector for soldering. Well, that was tricky, and unfortunately, I think I've got it wrong. Nick, could you have a look please and see if I can salvage the situation? 2. I was aiming for the leftmost connectors on the adaptor, but it looks like I missed the first one and have soldered to the second leftmost onwards. 3. Avoiding solder bridges on the connectors took alot of re-touching with the iron. Do you think I did well enough in terms of quality? It's not a bad attempt. I'd say it's a good thing you missed the first PCB pad because that now means that the pins are in the same order that they are on my own attempt. Just add an LED offcut for the OLED pad that you missed. Unfortunately I couldn't fit this in the blog entry because of a 10000 character limit. The amount of data for displays in the datasheet is even more dire than before (only has pinouts for three 7-segment displays and the OS96016PP08MB2B10 OLED). Fortunately the chip on glass module quite obviously has markings on the back so hopefully it won't be some custom part that is impossible to find data for. I went to a Maplin and they didn't have any of these new bags - the two bags it had contained the large LCD with pins which requires multiplexing. I went into the same Maplin again and they still don't have any of the new bags. The same Maplin continues to only have bags containing the large LCD that requires multiplexing which isn't very useful. This means it takes over a month for the new displays shown in the online pdf to arrive in stores. I didn't keep track of how long after the pdf changed from having the AMPY2001-11 LCD to having the bare glass with pins those bags appeared in stores so I can't predict when the new bags will turn up but even if I did know it's likely to be much longer for the new bags now because the contents of the bag that is to be replaced is less desirable compared with the bag before that. I went into a different Maplin and the only bag it had was one with the large LCD that requires multiplexing, the 7 segment LED displays, an OLED, etc. This different Maplin continues to not have the new bags. The first Maplin continues to not have the new bags. The first Maplin continues to not have the new bags. Almost five months since I first saw the updated PDF. Posting this must have harmed sales of the previous bags. The first Maplin had a new bag! Since Kemo obtain surplus stuff, all the new entrants are custom parts that you can't find data for. Not yet anyway. The LCD with the metal frame appears to be a graphic LCD of resolution 128x80 and is chip on glass. A Chinese website reveals what it is from. The smaller COG LCD, marked UMSH-7519AN-5F, also appears to be custom (which comes as a surprise). The outer few mm of the viewing area is lighter than the rest of the LCD which suggests it could be a graphic LCD. A distinguishing feature of the flex is that it has two pins at one end that aren't connected to the module so if a standard module with a flex with the same feature and pin count can be found chances are it has the same pinout. Long LCD that requires elastomeric connectors - 4 digit 7-segment, reflective. The pitch of the connections is quite large (but not 1") but there are sufficient connections to suggest that it is static drive. A dead 16x2 HD44780-compatible module can be used as a source for elastomeric connectors however the bare glass LCD here is more than half the length of a normal size 16x2 module so it would only provide enough for one display. VFD - this is also a custom part however its pinout can be clearly seen from the back. Voltages will have to be found by guesswork. It seems that when it comes to finding pinout diagrams, Kemo do really try as anything that has a pinout on the internet has one in their PDF - even the AMPY2001-11 which has a diagram based on one from an obscure Italian website. The VFD (SAMSUNG SSED HNM-05SS62T) is working in a PICAXE-controlled multiplexed circuit! For details on the VFD glass itself, see the other blog entry linked above. In terms of power consumption for the anode voltage with most of the segments lit, it is around 7mA at 20V (the minimum required for a good display) and 20mA at 45V. When comparing this to an LED display keep in mind that the voltages are higher so much more power is being used compared to 20mA at 5V. For best display brightness more volts are better. For driving the anodes and grids, PNP transistors with bases driven by NPN transistors via 10k resistors are used. Eight pairs are used for the anodes and four for the grids. Because only the dot from the middle grid is used in the above demo and it has an independent pin, the middle grid (grid 3) is connected to grid 2 and the dot is connected to the remaining pin on the 8-bit port used to drive the anodes (through the transistors). The grids must be pulled down to 0V when not activated - use resistors not less than 10k because rather large currents can flow when the associated PNP transistor is turned on and 50V is put across the resistor! Ideally transistor arrays in DIP packages should be used since the 12 pairs of transistors required take up almost an entire breadboard. Note: This OLED (or ones very similar) can be found in Indesit Company cookers. Thanks for posting this thread, I have two of these neat little OLEDS working now. New year, no new bag. The average difference between bag releases is 250 days. Based on that the new bag was due to be released on 27.07.2014, so it is well overdue. Hopefully a new one will be released soon with more interesting components.